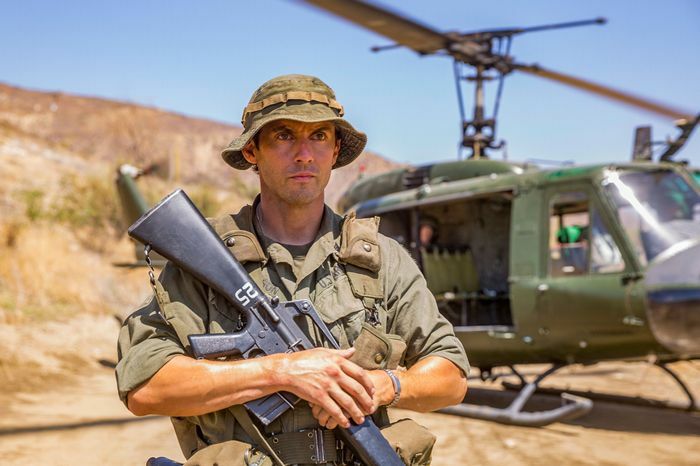 Like any This Is Us episode that breaks its own format to focus on one story, “Vietnam” might be divisive among fans. If, perhaps, you needed a little break from the angst of The Big Three (my hand is raised), you’ll probably be very into this episode that lays out some of the details surrounding Jack’s relationship with his younger brother Nicky (welcome, Michael Angarano, you are so well cast), and begins to tell the story of their time in the Vietnam War. If you’re extremely invested in Kate’s IVF storyline or Toby going off his antidepressants or Randall running for city council in Philadelphia, a city in which he does not live, well, you’ll have to wait for the next episode. This is all Pearson Brothers, Original Flavor. Jack’s a staff sergeant and he’s leading his men through some dodgy-looking jungle. There are landmines and bombs and conditions are terrible. Guess who’s there? The guy we saw Kevin writing an email to as he starts his search for more information on Jack’s time over there. Robinson. Apparently Jack was promoted quickly, even though Robinson’s been there longer — he’s 90 days away from getting to go home and all he can talk about is trying out for the MLB. Of course, we’ve seen Robinson as an old man, missing his foot, so we know those dreams don’t come true — and then we see the attack on the group of men that leads to that loss. Jack of course takes care of Robinson through it all. All the promos leading up to this episode were touting the fact that we were going to see “Jack become Jack,” which, 1) is a ridiculous sentence to type, but 2) what I think we learn is that … Jack’s always been Jack? Like, literally, his brother calls him Superman. So really we’ve learned nothing, NBC promo department! Actually, we do learn a very fun fact. Well, fun is relative since this all takes place during the Vietnam War BUT as Jack is waiting with Robinson, he calls Jack out for always pretending to not be scared. But of course Jack is scared. They’re all scared out of their minds over there. And then Robinson shares a trick he and his mom used when he was younger and scared that his father was going to beat them to death: His mother would hold his face and tell him to breathe. Robinson does this to Jack as he leaves — and of course we’ve seen this before. It’s how Jack used to calm Randall down, and how Randall quelled William’s fears as he was dying. We’re watching the origin story to this piece of the Pearson mythology. Anyway, I can’t wait for Kevin to meet this Robinson guy in the present day. Because of the skirmish they just endured, Jack and his men are assigned to a cushy security detail in a small fishing village. When Jack realizes the village is close to where he thinks Nicky is stationed — it’s the return address on a letter he has from his brother — Jack orchestrates this whole thing to win over his commanding officer and get permission to leave for 24 hours and find Nicky. See what I mean? That’s so Jack Pearson. We learn a few things hopping back this far. First, Jack’s not in Vietnam. In fact, he has an irregular heartbeat, so he was able to get out of the draft. We see that Jack’s dad is still as awful as he’s ever been — even the mailman can’t help but stare at Jack’s mom’s black eyes. And we see Jack’s mom receive the letter from Nicky that Jack had with him earlier. From the sound of it, he’s not doing well. He’s been “Article Fifteen-ed,” which means he’s being disciplined, apparently for being a danger to himself and others. The rest of the letter isn’t very hopeful. Nicky is sure he’s going to die over there. So, what does Jack do? He goes to see his doctor and figure out how he can cover up his irregular heartbeat and enlist. It’s Jack’s job to be there with Nicky — whether or not he can help him, he has to be there with him. Oh, also we see Jack in his undies, if that’s something you’ve been waiting for. I don’t know your life. It’s December 1, 1969 — the day of the draft. Nicky is understandably freaking out, but Jack reassures him as only Jack Pearson can. Everything’s going to be fine and if it’s not, he has a plan. Of course he does. Before he was making plans for his kids, before he was making plans for him and Rebecca, he was making plans for his brother. If anyone understood that you could always rely on Jack Pearson, Nick Pearson sure did. He calls him his personal Superman — and Nick is always Lois Lane, in need of saving. But as reassuring as Jack can be, he’s no match for the impending draft lottery. Jack decides it’s best to watch it at a local bar, away from their father. Of course, their father has a few choice words for his sons before they leave — and you can easily see that he’s harder on the younger Pearson. Obviously, we know Nicky is over in Vietnam, so it’s not a huge surprise when his birthday, October 18, is called fifth. Yet still, the entire scene in that bar is pretty gutting. And because I’m a glutton for pain (I mean, I watch this show), I went to see when October 19 was called. It was number 241. Jack’s big plan is to help Nicky run away to Canada, but while on their way, Nicky realizes that his dad will never speak to him again if he dodges. Jack wakes up the next morning to find an empty hotel bed next to him and a note: “It’s my turn to save the day, now.” And just like that, Nicky’s gone. We come upon the Pearson brothers as we’ve seen them before, just little boys taking care of each other. Nicky’s already down on himself and the fact that he needs to be taken care of by Jack. Jack’s already taken on the job of building his brother back up: He tells Nicky that he wears glasses just like Clark Kent — they are both heroes in disguise. And yet, it’s Jack who scares off their dad when they find him about to hit their mother yet again. Afterward, Jack’s mother feels how fast his heart is beating. “It always beats fast,” he tells her. He wasn’t lying when he told Robinson that he’s been pretending not to be scared his entire life. If that moment isn’t enough of a tug at the heartstrings for ya, This Is Us does something so This Is Us: We learn that Nicky was born on October 18, 1948 at 11:58 p.m. Two minutes. It was two minutes that altered the course of Pearson history. Back where we started, we finally get a look at Nicky as he is when Jack finds him. He looks like he has been through some things. And we know it only gets worse.